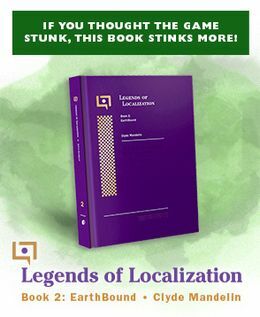 Here’s a piece of EarthBound merchandise almost no one knows about, and only two have been confirmed to exist in the past 10+ years that Starmen.Net has been around. This is the tale… of the EarthBound Ruler! I forget what happened after that, but my very vague memory says that people either didn’t believe him or the person eventually admitted it to being fake or something. So word about it didn’t really spread much and most fans today have never heard of it. It appears that Nintendo sent out special EarthBound “press packs” to magazines and other people around the time the game was released, possibly even giving them out at things like CES or E3 (was E3 even around in 1995?). Anyway, these press packs are obviously extremely rare, and the fact that only PARTS of them turn up once every 10 years goes to show how hard it is to find them nowadays. It’d be so awesome to see that Mach Pizza box and the other stuff that came along with it. POLL: Did you know about these rulers before? oh man! i kinda want one. you know… for measurin’ stuff. I’d be more interested if someone found the Mach Pizza boxes… they are more likely to have been lost or destroyed though. These rulers just look like Nintendo slapped their name, logo, and EB’s logo on them. What, no EarthBound protractors? EarthBound toothbrushes? EarthBound broken-key machines? I saw this on GameFAQs, uh…I dunno. I’m skeptical about this. doesn’t really seem real. pretty skeptical. but i could be proven wrong. I know a lot of people have low-self esteem when it comes to their own creative abilities; but seriously. If you really want one of these rulers, you should make one yourself. The first scans seem photoshopped, but the second pictures look very real. Of course, I bet you could go to a place and get something like that put on a ruler. Y’know, like businesses do to get their name out. btw, I like the new Summers background! Well so much for running dry on new, interesting Earthbound news. I bet that thing would fetch around $1,500,000 on ebay. I wish I had one of those rulers. Then I could measure the length of things easily. Zedrein, That’s a bit far fetched, I would think more like $100. a real earthbound ruler would be 3.6 inches. The New Age Retro Hippy/ Jeff used ruler! He can easily measure things now! The ruler has a buy price of $2 and a sell price of $1. Anyone know the exchange rate between Earthbound Dollars and US Dollars? Great thing this ruler actually HAS a purpose. Yes, E3 was around in 1995. I have the cbr of the Nintendo Power issue that covered it. Earthbound was there in fact. Well, a hamburger in Earthbound normally runs you around $14. And in the US, you can get one at McDonalds and other places for around $1. Therefore we can assume that it takes 14 EB dollars to equal 1 US dollar. 2 / 14 = .1428…. Considering that there are so few of these EB rulers, they’re worth thousands. But I doubt you’ll get one to go that high on eBay. Maybe it’ll go for $1000 tops. Man, with this ruler, I could easily figure out the lenght of things. Too bad there’s only few. As much as I’d love to have one, I have bad luck with rulers. Bent, broken, and burned. I think I ate one, too. So, if you have the ruler, you can get into fights, and then size things up? Why don’t you ask the Hippie about the price? I had heard of them before. So maybe it’s real. Mato, have you guys at Starmen ever got a confirmation about these rulers from someone in Nintendo or the press to confirm they’re real? 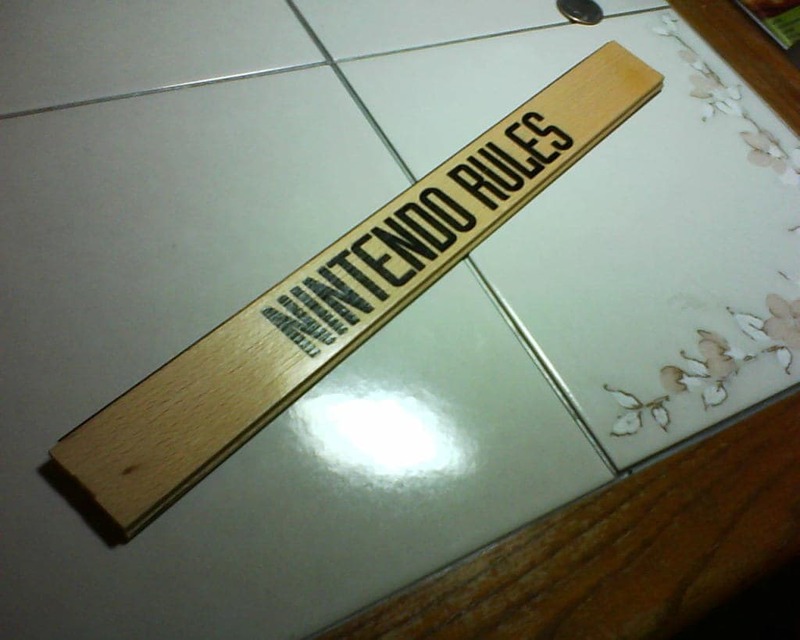 Why would someone counterfeit a piece of game memorabilia so mundane as a ruler? The internet is full of strange and wonderful people. I wouldn’t put anything past them. It is probably legit. However, if someone could convince people they have something super-duper rare, I’m talking 1/256 drop rate, they could make quite a bit of cash off it. 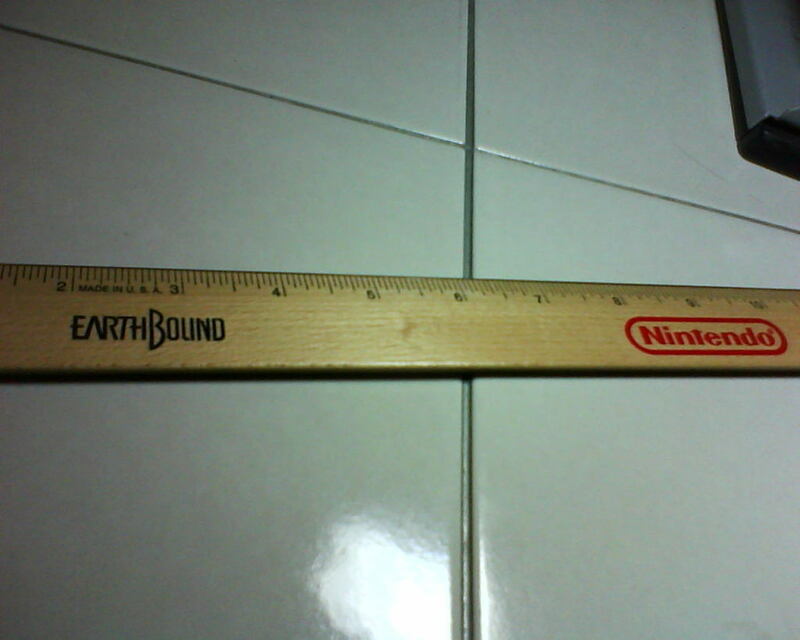 Great, I need to get this ruler (or mod a ruler, like everything else) to complete my EarthBound Schoolpack! Tired of boring schooldays, were EarthBound wings around your mind and you can’t even think about anything else? MOTHERMoondance here with a new product: EarthBound Schoolpack! EarthBound Eraser (An Erasable Eraser. Includes Eraser Eraser! And if you call now, you might even receive an impressive 3-inch Mr. Saturn plushie! makes you wish that you had ab bottemless pile of money….